6.06 points at 17 votes (rank 622). The Gorfian Empire poses a great threat for the Instellar Union. The task is to destroy the flagship's fleet. The Gorf fleet consists of androids, laser ships, attack ships, the space warp fighter squadron, flagships and of course the Gorf themselves. Each flagship sends four attack waves, this corresponds to four different levels. During the battle you need to fight the attackers and the flagship behind each force. After fending off all four attack waves successfully there is a promotion. Then the Gorfians send an even more powerful flagship and a stronger attacking force. So the four levels start anew with a higher difficulty grade. 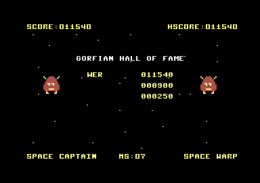 The Gorfian attack starts with the setup of three android fleets. These are lead by a Gorf and supported by small and big UFOs. The androids attack in the shape of a matrix, that tries to destroy your fleet. With rising rank the Gorf sends the androids in a lower height. With a bit of skill the Gorf and some androids can already be destroyed before the attack formation is complete. At the same time you are supported by a force field that gives you certain protection. Here, your battle squadron is attacked by two Gorfian forces at the same time. Each force consists of a Gorf leader, three attack ships and one laser ship. The laser ship forms the spearhead, it has an extremely efficient and extensive energy beam, that you should pay special attention to. The space warp fighter squadron is the highly developed Gorf force. It starts from a protective space warp in a spiral shaped formation. This fighter squadron is equipped with special torpedoes that shoot exactly at your position by a homeing radar. With rising rank not only the number and speed of the fighter squadron rises, but also the number of torpedoes. When you have reached the flagship you need a certain attack strategy. 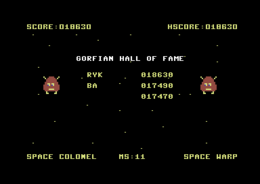 Gorfian flagships are protected by a force field. Even if you have destroyed this force field and hit the flagship, only a small piece of the ship is blasted from it. These pieces flying through space are as dangerous as the fire balls that are permanently shot at you. The only possibility to destroy the flagship and with this end your mission, is to pierce the body of the ship and cause the atomic reactor to explode by laying it open. In advanced missions the flagship is accompanied by Gorfs. Graphics: The single missions take place in a 2D design on one screen. The graphics are rather simple and do without much colour. In one line at the upper border of the screen you get shown the current score, the number of fighting jets left and the highscore. At the lower border of the screen you see the current rank, the mission number and name. "You have been promoted to captain"
"Some galactic defender you are"
Your fighter jet is controlled by the joystick in port 1. A movement into all 4 directions can be done, so up, down, left and right. You shoot a missile with the fire button. Here several short range missiles can be shot on near targets. Long range missiles, however, are removed by firing another missile. So only one missile is out at a time. This can be helpful but also a disadvantage, here you need to use the right strategy. By pressing the RESTORE key, the game can be restarted without resetting the highscore. Wiht the key RUN/STOP the game is paused until the joystick is moved or the fire button is pressed. At best you first destroy as many androids as possible while the Gorf is still occupied with setting up the fleet. If you destroy the Gorf during this time the fleet will be send out completely anyway. You are more successful if you attack the matrix from the flanks, so the left and right side. From that your work way to the middle. If you place your ship at a convenient side of the matrix they will move exactly into your fireline. Furthermore, you should position your fighter jet preferably below the protective force field. Due to the extremely dangerous and extensive energy beam, you should first destroy the laser ships. Then the rest of the attackers and finally the Gorf. But beware, after the laser ship has been destroyed by a fighting group, the Gorf and the attack ships will permanently go for the fighter jet. The Space Warp Fighters should be destroyed as early as possible. Move as close as possible to the start centre to shorten the fire time. But beware of the fire balls! Move your fighter jet from one side to the other during firing, to avoid the torpedoes, but at the same time try to stay on the middle line if possible. At first remove a bigger part of the force field. Then try to aim for a break through to the reactor. FXXS: "The idea to present different variations of Space Invaders or respectively Galaxy in the single levels is quite nice, but the end product has unfortunately not turned out any better than the originals, therefore 6 points..."
Robotron2084: "Well, the game was not a bringer in the arcade hall. And then there is a whole level (which is Galaxian!) missing here. Furthermore, the game gets unmanagably difficult in the third round. So, I give 5,5 points of 10." Shakermaker303: "I was excited by "Gorf" from the beginning. The sounds are ok, playability and controls of the own fighter as well. 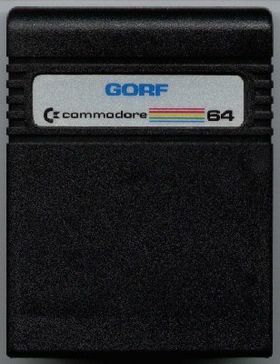 It belonged to my first 3 games for the C64, I had it as a cartridge and give the game 8 out of 10 points, although it is supposed to be a clone." Ragnarok: "This game reduces Aristoteles to absurdity: The whole thing obviously is not necessarily the sum of its parts.... from me only 3 points and a hearty yawn!" TheRyk: "Unfortunately, the attack wave 'space warp' totally spoils it all. From round to round, avoiding the asteroids more and more becomes a matter of luck, which is a pity, because otherwise, the game is really fun to play. However, I rate it 5 points including some old school bonus." 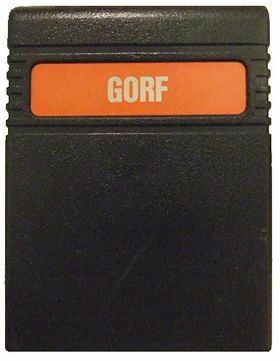 If you spell GORF backwards, you get the word FROG, allegedly the nick name of the original programmer or a allusion to the hopping Gorf at the beginning of the game. In the commercials, however, Gorf was given as a shortage for Galactic Orbiting Robot Force. The orginal arcade machine version consists of 5 level, so one level more. Level 3 is Galaxian there. The first level is a clone of Space Invaders, but with only 24 enemies instead of 55. 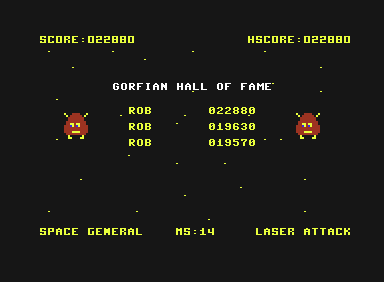 The Galaxians level (24 enemies in Gorf, 346 in the original) is not contained in any conversion due to legal licensing reasons. 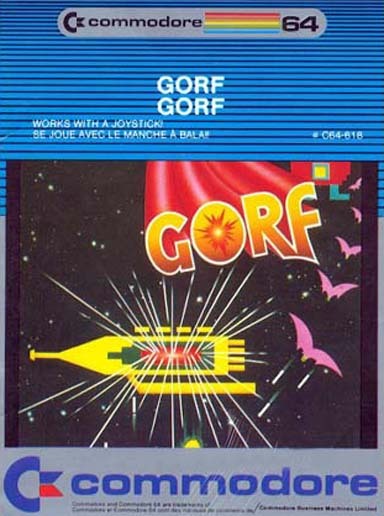 Gorf in the Killer List Of Videogames. This page was last modified on 8 June 2016, at 23:22.